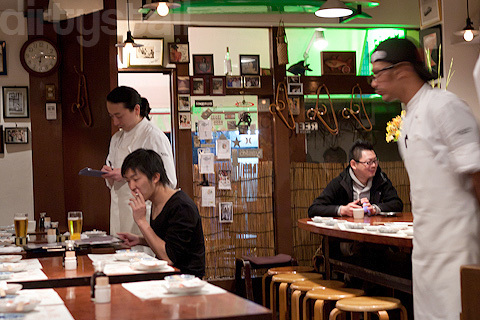 Yes I’m back again at Kaikaya, which I first visited back in 2009 and wrote about it. I liked it so much that I decided to return to Kaikaya again this time to try some other dishes there. For this visit, I decided to try their omakase menu, something that they don’t advertise at all on their website or even on the menus at the restaurant. You have to ask them about it in person. Some of the dishes were repeated from my previous visit, but that’s because they are the house specials and crowd favourites, so I would have ordered them anyway. Once again, counter seats give you the best view of the action. 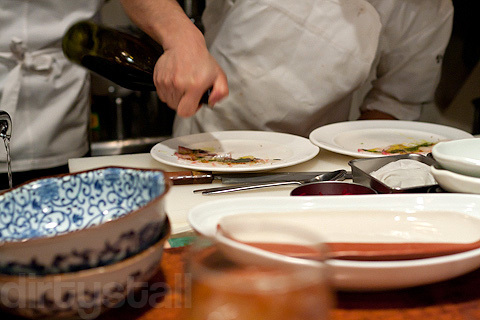 This dish is one of their specialities and almost everyone orders it. 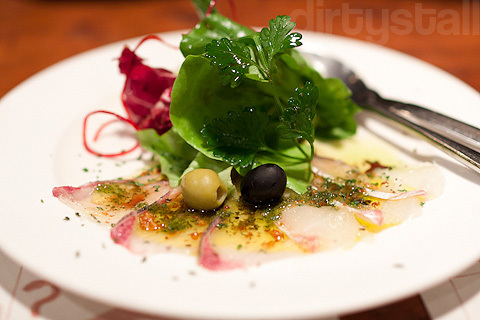 It’s basically hamachi carpaccio with pesto, fried garlic bits, olive oil, balsamic vinegar and sweet basil. The concoction of the above sauces literally floods your mouth with so many tastes, even the salad tastes good! 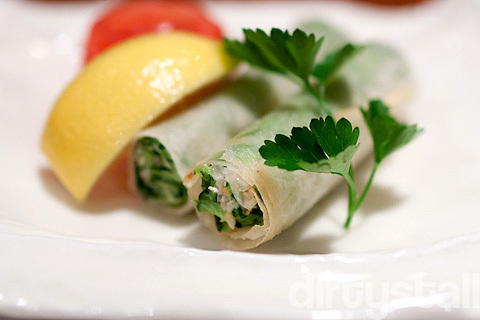 This is crabmeat springroll salad. I didn’t really like this dish too much as there was too much raw onions inside which masked the taste of the crab meat. But luckily this time around there was more crabmeat this time so it tasted much better. Third course was yet another of my favourites, the Ebi no Ebiniyoru Ebi-sousu (海老のえびによるエビソース). Another popular dish. 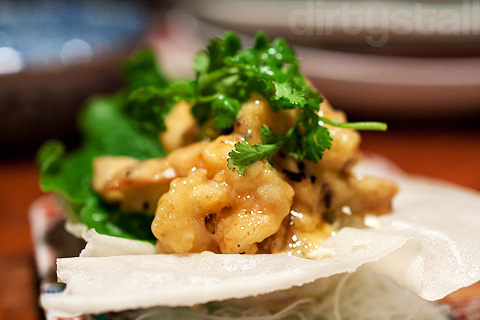 These are large fried prawns covered in a rich and creamy prawn sauce served on a ricepaper cracker. The sauce is supposed to be made from the stuff in the heads of the prawns which certainly accounts for the strong unami taste. There is so much sauce that you have to break off pieces of the “plate” to clean up. I love this so much, I would have ordered this even if it didn’t come! 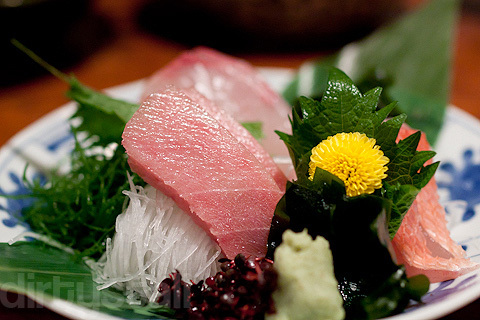 Fourth course was their sashimi mini-dish (ミニ盛 2人前) – tai, hamachi and chu-toro maguro. It tastes as good as it looks 😀 Clean and succulent. Fifth course was another house special, Maguro no kama no supearibu (マグロのかまのスペアリブ). This is a house special dish that the manager, Ippei-san, likes to recommend, their tuna cheek “spare ribs”. 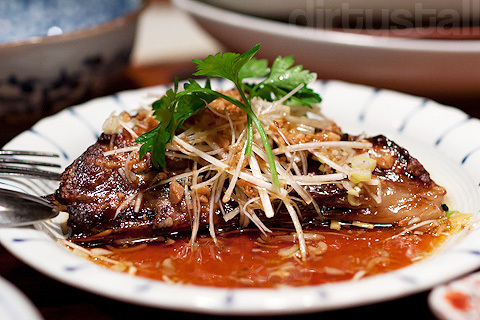 It is supposed to imitate the pork spare ribs but it is actually the collar and cheek of a tuna. There is a huge chunk of tasty and succulent tuna meat and it is complemented by the sauce which might be red-wine based. A bit smaller than the previous time I had it. Sixth course was something new, Tara no shirako no Gorgonzola guratan (タラの精子のゴルゴンゾーラのグラタン). 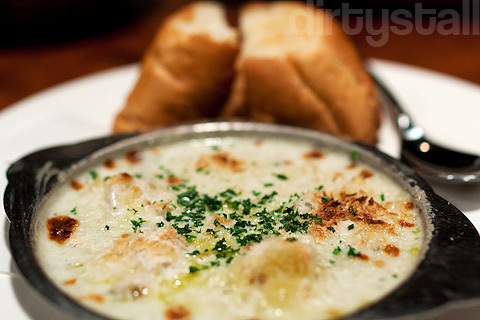 Also known as cod sperm au gorgonzola gratin. Having eaten shirako before, I think these were grilled first then baked in the cheese. Actually it was very nice but then grilled cheese usually makes everything nice 😀 It came with bread to mop up all the corners of cheese. The seventh course was much simpler, Zako no guriru (雑魚のグリル). 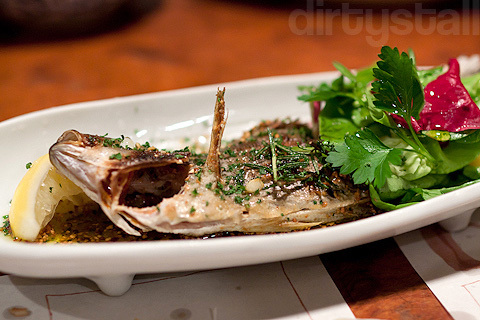 This is just fresh fish caught in the Sagami Bay area, grilled with olive oil, lemon and garlic. And sometimes, that’s the way fresh fish should be cooked to bring out the natural flavours. Eight course was some carbo to end the meal, Shimofuri Kobe-gyu no Nigiri-zushi (霜降神戸牛のにぎりずし). 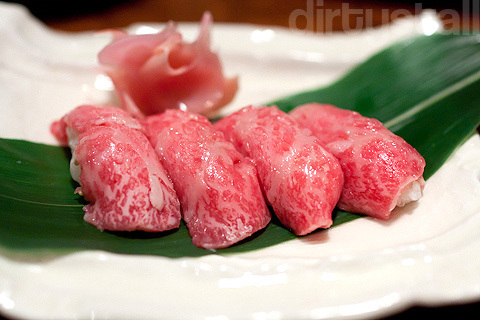 Kobe beef sushi, the raw beef feeling almost like fatty raw tuna because of the high fat content. It’s a fantastic finish to the omakase! And usually to go with rice they always serve miso soup so they gave a bowl of Hama no Miso-shiru (漁師風浜の味噌汁). 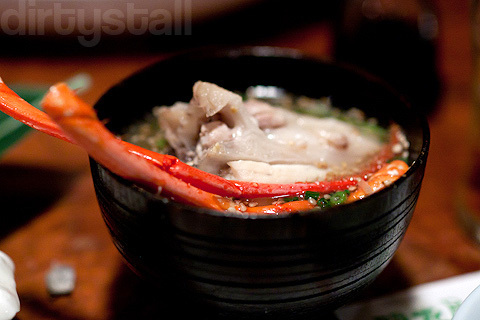 This is assorted seafood soup that’s normally given in a bigger bowl for sharing with 2+ people. There was actually more ingredients than soup, and although I’m sure these are the left-over parts that don’t make it into the real soup, it’s still very tasty – look at the lobster legs sticking out! All in all that was a great omakase selection from Kaikaya, mostly made up of their classic favourites that most people order when they go to Kaikaya. It’s definitely much better then ordering the dishes one by one and getting the full-size versions which you won’t won’t be able to finish if you ordered so much. 8 Responses to "Kaikaya Redux"
Thanks for all the reviews 😀 Now I know exactly where I want to go next time i’m in tokyo! That shirako gratin looks super delicious! So is the grilled fish… Sigh… I think I will so love this place. 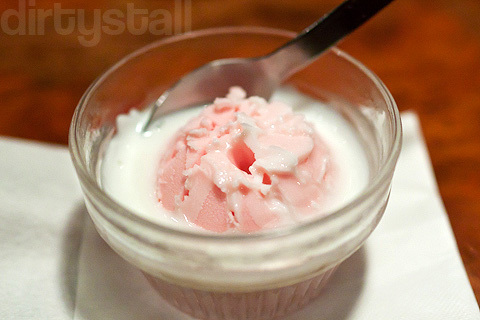 hehe this is sakura gelato with wine simmered sweet beans, you said strawberry with coconut milk last time hahaha. Where are the sweet beans? I don’t see any. How come you know of all these Japanese restaurants?